Torrenting is a controversial issue. It is often associated with piracy, but downloading content using the BitTorrent protocol is far from black and white. In this torrent guide, you can read in depth about the using world’s most famous peer-to-peer (P2P) file sharing technology. We'll cover how to torrent and answer the big question: 'Is torrenting illegal? We’ll also discuss plenty more, from what a torrent actually is to how to choose your torrent client. Torrenting 101 focuses on the modern-day magic that is torrenting. Torrenting is the act of downloading files online, using a Torrent client and the BitTorrent protocol. When you torrent, you download a file from a variety of sources (peers). 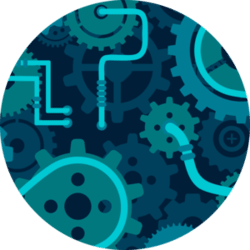 The BitTorrent operating principle makes the overall process smooth, fast, extremely efficient, and safe when using a VPN. A torrent is a file that contains metadata about the content you are about to download. This can be any movie, song, game, application or document. You download the path to reach the full file by using your client. In short, a torrent file is created by a central BitTorrent-enabled host server, which embeds the URLs of trackers. These are needed to download both the data and the list of peers seeding the pieces of the original file. 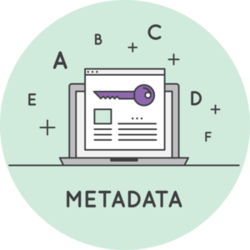 What’s in a Torrent Metadata? The BitTorrent client tries to set up a connection to the tracker to receive a list of the peers that are currently downloading pieces of the file. 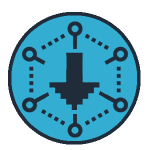 Peers are users who are downloading the files or seeders who have already downloaded the complete data, and are now making it available to other downloaders. The download speed is usually better for more popular torrents. Torrents work in a decentralized manner. Every user downloads and uploads torrent files, making the whole process more efficient. Initially, the original file is transmitted from the seed to each client once. Next, the data is transferred piece by piece between different clients. computer and making it available to peers. Peers A peer is a user who participates in file-sharing in a peer-to-peer network. Swarms A swarm is a selection of peers who share (download and upload) the same torrent. Seeders A seeder is someone who downloads and uploads torrents simultaneously. Leechers Leechers only download torrents and don’t upload them. It is considered good manners to upload the same amount that you download. Many trackers ban users who disable uploading. Indexers Indexers are websites that amass torrents and provide information about them. They are forums where you can find, share, download or ask for torrent files. 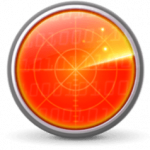 Trackers Trackers are the servers that direct data packets between peers and try to find other peers in the network. Clients A torrent client is a piece of software that allows you to download torrents. Clients are made for managing torrent files, including handling the downloading and uploading, connecting to peers and providing statistics about the torrent. Magnet Links Think of them as a torrent ISBN. 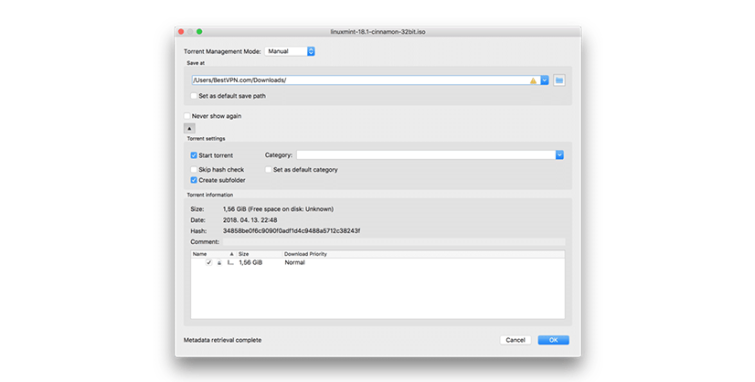 The torrent file tells your torrent client the names of the files being shared and a URL for the tracker. The torrent client creates a unique hash code for each torrent, much like an ISBN number. A magnet link is a hyperlink containing a torrent’s hash code. Before you can begin torrenting, you need to make a few preparations. All things considered, we recommend using qBitTorrent as your default client. 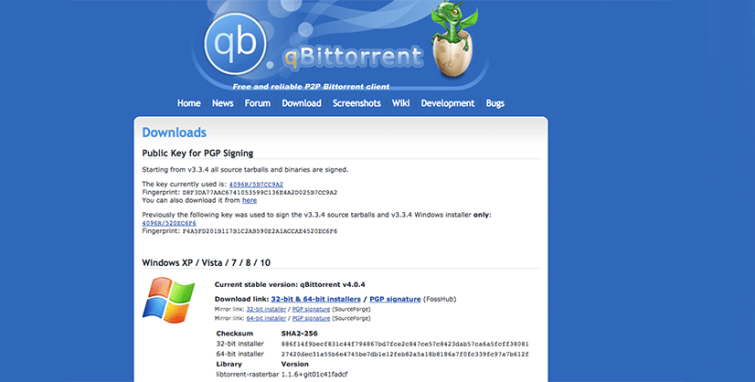 You can download qBitTorrent for all major platforms from its official page, here. Installing the program is as simple as installing any other software. The setup doesn't require you take any additional steps, or do anything out of the ordinary. Note that some antivirus and malware software can flag torrent clients as viruses. If this happens, just ignore the warning – provided you downloaded the client from a reputable source! Now that you’ve set up your client, it's time to find a torrent to download. Torrent sites work as indexer pages. They compile a list of torrents and information. They also function as communities where users can discuss torrenting. You can share, download and request files in these sites. The world’s most popular torrent site is The Pirate Bay. Most sites have a search bar to help you find the torrent you need. Type the name of the content you want and hit Enter. Search results are ranked according to either the number of peers or leechers, or the date of uploading. To start downloading, click on the download sign or magnet link. Magnet links try to open your client. If you save a .torrent file, you have to do this manually. Your torrent client has a few options to configure your downloading, like adding a category, changing the destination folder or adding a speed limit. You can also use it to see the package’s details. Hit the OK button to proceed. While downloading, you can monitor the number of peers and seeds, as well as your download speed and the estimated completion time. There is no precise timescale for how long you should store the files you've downloaded. However, it’s polite to store files for as long as you downloaded. Storing them for 48 hours is courteous and will help others. Seeding starts automatically, so you don’t need to do anything in order to start it. Choosing the best torrent client seems pretty straightforward, but there are plenty of factors to consider. Here is a quick rundown of the different torrent clients available. You can search for torrents from within the client. In addition, the built-in media player helps you check your downloaded media. Transmission started life as a Mac- and Linux-only BitTorrent client. It began to collect users and nowadays Windows users can also get in on the act. Transmission also supports many optional add-ons that boost the user experience. These include RSS subscription tools and a Kodi plugin. Vuze is the descendant of the original BitTorrent clients. As time has passed, Vuze has improved and changed for the benefit of its users. There are plenty of other BitTorrent clients out there. Based on our testing and experience, qBittorent is the best of the bunch. Folx BitTorrent client impressed me with its simplicity of use and advanced functionality. Thinking of Folx I can come to a download manager and a torrent search. Two-in-one solution. It’s a unique combination of features because you can find and download any torrent you need with safe and ease and you can manage your downloads the way you like. Want a speed increase? Here you are. Need a rare torrent that is hidden from a public use? Get it! Would like your file on Friday morning just before the meeting starts? No problem, schedule the download on Friday at 8am. On the whole, a great tool! Torrenting is not illegal! Despite what many people think, torrenting is entirely legal. 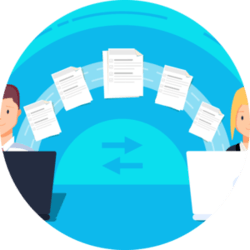 It is one of the best ways to share large files with large audiences. However, there are some caveats to watch out for. The torrent peer-to-peer protocol (BitTorrent) is an entirely legal file-sharing technology. However, there is a difference between the legality of the technology itself and the way you use it. 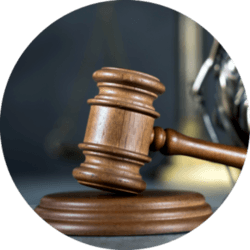 The legality of your torrents depends on factors such as your location and the copyrights that apply to the files you download. Laws and copyright policies differ from country to country. As such, before you start torrenting, you should check out your country’s stance on it. Be aware that torrenting also carries other risks. You could download infected files, as well as facing punishment from the authorities. Thankfully, there are ways to increase the safety of torrenting, as we discuss below. BitTorrent is a legal technology for transferring information. If you choose to download torrent files that are owned by someone else and protected by copyright, you are doing something illegal. 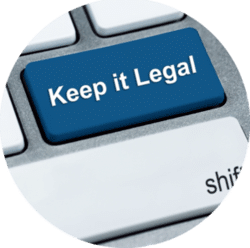 You can read more about what and how laws apply to you and your torrenting, in our in-depth torrent legality article. If you want to download free movies, Torrent TV shows like Game of Thrones, games or documents from torrent websites without infringing on anyone’s copyright, there are many legal ways to do so. Unfortunately, most popular torrent websites don't provide the opportunity to download legally shared content (or at least don’t provide any data on this). Most legal torrents are either files where the copyright has expired or files that were released with a licence allowing free and open distribution. Public Domain Torrents hosts classic movies and B-Movies that you can download for free. It's easy to choose the best film to watch by browsing categories or using the search bar. Many movies hosted here are difficult to find elsewhere. Internet Archive has an extensive collection of films, series, texts and audio for you to enjoy. Internet Archive also offers another outstanding service, called Wayback Machine. This lets you view captured website screenshots. In 2016, several significant events rocked the torrenting community. The authorities shut down the world’s most famous torrent database, KickassTorrents. Torrentz, a torrent search engine giant, also unexpectedly closed its doors. These e vents left two big holes in the torrent community. In 2017, another big player – ExtraTorrent – also permanently closed its doors. Here are a few great alternatives that are attempting to fill the spaces left in torrenters’ hearts. The Pirate Bay is currently the most popular torrent index in the world. A simple interface, with a vast selection of torrents and minimal adverts, are key to The Pirate Bay’s popularity. 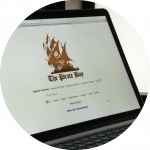 If ever there was a true successor to KickassTorrents, The Pirate Bay is it! RarBG was hosted initially in Bulgaria, but hops around to evade the authorities. It started off as a BitTorrent tracker in 2008, but has since grown to provide torrent files and magnet links to over 300,000 users per day. The website stands out as it is easy for newbies to understand, while a sizeable community also regularly posts feedback on torrents. Sadly, some countries have banned RarBG, including Saudi Arabia, the United Kingdom, Denmark, Portugal and India. Fortunately, using a VPN service will make RarBG accessible wherever you are! YTS.ag is entirely the best BitTorrent tracker for film lovers. It is slightly different from The Pirate Bay and RarBG, focussing particularly on movies. YTS.ag has a pretty smooth interface, which is perhaps my favorite on this list. There is also an impressive collection of movies in high-def 720p, 1080p and even 3D. Do you ever worry about the authorities tracking your torrenting activity? In the world peer-to-peer file-sharing, it’s certainly possible. As such, here are some useful precautions that you can take to avoid anyone snooping on you. Internet Service Providers (ISPs) are increasingly monitoring the activities of customers who torrent. They can even see which specific files you download. What’s more, many ISPs make an effort to block upstream torrent speeds, to prevent seeding and excessive bandwidth usage. Non-profit organizations and research institutions – like schools – monitor torrent swarms for research purposes. They collect generalized data traffic to create patterns for building new algorithms. Although this group might not seem to be a security threat, your IP address may still end up in their database associated with file downloads. This group of companies is the most active and the most likely to pose the highest security risk to torrent users. Estimates suggest that it takes just 60 seconds from the start of a download for such agencies to log a torrenter’s IP address. Profit-oriented monitoring agencies sell these databases to interested parties. Some agencies also use them for less friendly purposes. 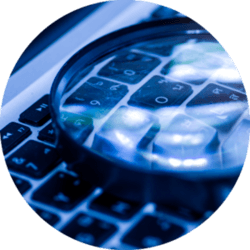 Your IP address is like a digital fingerprint; it can reveal your past activities. Three different services allow you to check your torrent IP. VPN providers run two of these, while the third is entirely independent. 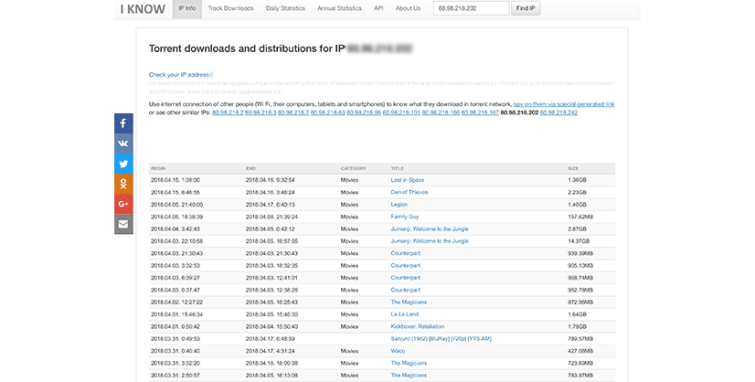 ScanEye is a global torrent monitor. It automatically detects your IP address, then checks it against a database of torrent file-sharing activities. A ‘clear’ result means that your file-sharing activity is not being monitored (rather than that you haven’t been torrenting). IKnowWhatYouDownload is similar to ScanEye. It has a massive database of IP addresses that have been caught downloading torrents. The site monitors 700,000,000 peers daily. You need to use a VPN if you want to protect your privacy and stay safe and secure while torrenting. A VPN provides perfect privacy by hiding you from your ISP and hiding your real identity from other file-sharers in the swarm. A VPN works like a shield between your computer and your ISP’s servers. Your ISP won't see your real IP address. As VPN servers run in various locations around the world, you can even pretend to be in another country. We considered a wide range of criteria in order to find the best VPN for torrenting. The absolute winner was Buffered. Buffered is the best VPN for torrenting. It's located in Gibraltar, has servers in 45 countries and keeps no logs of your activity. It is frequently rated among the fastest VPNs that we test, so its speeds are above average. It also has a firewall-based kill switch, which is the best way to protect against dropped VPN connections. Furthermore, Buffered has a unique benefit that no other VPN has: it can discover open ports on public WiFi networks. We use encryption every day, though many people don't realize it. Encryption prevents third parties from reading your transferred data and helps keep you safe online. Encryption protects sensitive data like passwords, credit card numbers and addresses. If you use public WiFi without encryption, hackers can potentially read your data stream. Furthermore, without encryption your ISP can view your activity and internet history. If your ISP doesn’t support the use of P2P services, which many don’t due to the vast volume of data streaming, it has the ability to throttle your upload and download speeds. If you want to torrent privately, the best option is to use VPN. Alternatively, if you only want to encrypt your torrent files, you can do it with the built-in encryption. Encryption disabled – we don't advise torrenting in this mode. 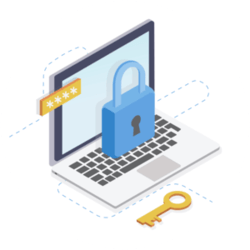 Optional encryption – this will use encryption with peers who have it enabled, but will also connect to unencrypted peers. Forced encryption – this will only connect to encryption-enabled peers. You can use a proxy to hide your IP address. However, it only protects your IP from your peers in the torrent client – not your web browser IP. Using encryption means that nobody, not even your ISP, can see what you’re doing online. Thus you can use BitTorrent as you please. Using proxies or tunnels can slow down your connection, as can encryption. 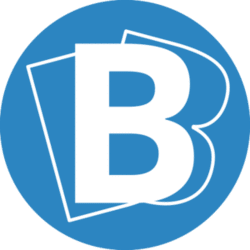 However, many people are happy to take a performance hit in order to have better-secured BitTorrent connection. Clients’ built-in encryption has a key strength of between 60-80 bits. This is quite weak compared to Advanced Encryption Standard (AES), which is the standard for most VPNs. Each torrent client has its own encryption technology. Most importantly, some of them only encrypt the headers of the data packets, not the contents. The torrent encryption was made to help torrent traffic survive deep packet inspection (DPI) and torrent-blocking firewalls. Sandvine, an ISP firewall builder, reportedly identifies and blocks most BitTorrent traffic, despite the encryption protocol. The best encryption comes from using VPN services. These let you download faster than with a proxy server, as well as providing you with maximum security. Aseedbox is a remote server that you can use for torrenting. They are in high-bandwidth data centers and are fast and secure. Seedboxes’ speeds range from 100Mbps (8MB/s) to 10Gbps (1250MB/s). Access to a seedbox means you can anonymously download torrents significantly faster. Seedboxes often have other features included too, such as a VPN, secure remote desktop, automation tools and more. Seedboxes can be expensive, but if you torrent a lot, then they are worth it. Generally, the biggest advantage of using a seedbox is that the download and upload speeds are faster than with a standard peer computer. History of File Sharing - Where Did Torrenting Come From? If you’re wondering how torrenting came about, here is a short history of file-sharing, to show you how it all happened. This type of network model was created by the co-work of the UCLA, UC Santa Barbara and the University of Utah. The system treated computers equally. American students developed a UNIX-protocols-standing on the system. Usenet was a distributed computer interfacing system. It was set up to provide everyone with a service to receive, store and forward the same news. This gave birth to terms such as "FAQ" and "spam." If you're looking for a Usenet provider, you can find the Best Usenet providers here. 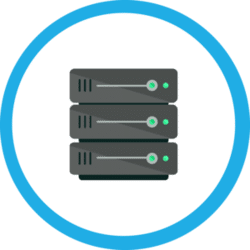 The client-server model bloomed throughout the 1980s and 90s. Most of the file transfers happened over landline telephone lines, with FTP and USENET. At the end of the 90s, Shawn Fanning developed Napster to let users download MP3 files by installing a free program to search around local disks. Gnutella was a new way of file sharing. It allowed by allowing users to find each other and connect remotely. It was established in 2000, and became the first decentralized P2P file sharing network, which is still active today. LimeWire was an example of one of many Gnutella clients. Freenet brought about an enormous improvement in users’ anonymity due to its efforts to be a dedicated platform for censorship-resistant communication. It allowed users to store encrypted particles of files. Bram Cohen created the BitTorrent protocol to allow peers to communicate directly over a TCP port. It relied on central trackers to record the location/availability of files and to coordinate users. Uniquely, the design allowed for new networks to be created. All things considered, torrenting is about much more than anonymously downloading the latest episode of your favorite sitcom. If you're interested in the latest trends and would like more information about the most advanced privacy technologies, check our feed.